Sent to me by my friend Nina. The saddest part is I would eat this and enjoy it. Bob: aWww geez eh, dinners almost ready eh. Doug: Oh, like, what’s for dinner eh? Bob: Leese we got some ham piclke,..
Doug: Ham pickle? What’s ham pickle then eh? Bob: ya know it’s like a piece a ham draped round a pickle. Doug: ham rapped round a pickle? Doug: Oh I like those. What else is for dinner eh? Bob: oh yea we got some Kraft Dinner too eh. Are you making fun of Canadians? While I cannot support stereotypes, I do know that Canadians love Kraft Dinner. It’s the number one selling grocery store item! No it’s more an homage to a hilarious set of characters created by some brilliant Canadians. 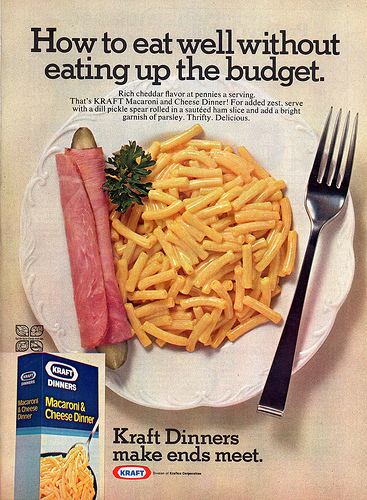 Also Kraft Dinner sounds so much Classier than Mac ‘n Cheese. Mac ‘n Cheese sounds like kids junk food. But Kraft Dinner, well it’s a dinner, that sounds legitimate. That ham pickle certainly does make the plate look a hell of a lot more interesting, although I don’t think that’s a net positive. Perhaps the saddest part is that I don’t understand your statement about “the saddest part”. I have no shame in saying I’d enjoy that!